The UBC Faculty of Medicine has agreements and partnerships with institutes, hospitals, medical colleges and universities in the Asia-Pacific region to develop education and research programs. This includes the exchange of scholarly information to achieve common research goals, development of potential research linkages, provision of learning opportunities and appropriate environments for trainees, fellows and visiting professors, co-sponsorship of colloquia, lectures and seminars, and invitations to attend meetings and national and international conferences. UBC and Zhejiang University, Hangzhou, China have established a Collaborative Research Centre in Reproductive Medicine, with Professor Hefeng Huang, Professor Peter C.K. Leung, and Professor Robert M. Liston as Co-Directors. 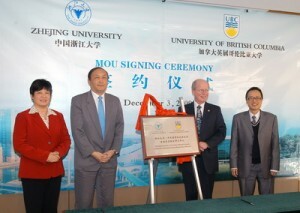 In October 2010, representatives from the Faculty of Medicine attended the China Scholarship Council International Graduate Scholarship Fairs in Beijing, Shanghai and Xi’an to meet with potential Chinese graduate students.